Any fellow 30 Rock fans out there? Speaking of deal-breakers, I have just abandoned another book without finishing it. I can't describe to you the emotional turmoil I feel when I abandon a book. I am a project-finisher--I gain the most pleasure from the "ending" process of a project. As a result, I will stay up all night with a good book just to have the pleasure of finishing the dang thing. So when I have invested time and energy into reading a book and I decide it's not worth finishing...SUCH a disappointment. relationship is the timing...timing is everything. Even a thriller can be boring if you are too busy to read it. 5. "A Tale of Two Cities" : Ok, I know...take me out for my public flogging. I know so many people who absolutely love this book and tell me I would love it too (my husband included). Perhaps this is one of those things where we were "meant to be together" but I was distracted in grad school and then it was "too intellectual" for beach reading and then I just felt burned by the whole relationship so I figured "why bother trying?" Tell me your deal-breaker books, friends--and please include the embarrassing ones that everyone will respond to with "WHY didn't you finish that book? You are insane!" Any tips on returning to or getting through a book you've been stuck with? i stop reading a book when it is sad... i like fairy tail endings so when it gets too sad to handle i quit reading and make up my own ending. i do the same with movies. i didn't finish little women (that's my public flogging). i walked out of armageddon. the list goes on... on a more serious note - i didn't finish "purpose driven life"
I know what you mean. As an English major and lover of all words written, I feel AWFUL when I don't want to finish a book. I continue for a while and try to slog through but eventually...it has to go. I didn't finish "Wicked" - the book about the play (or play was about the book I think... anyway). I was really looking forward to reading it... LOVED the play, and it was just too dark and just plain WEIRD. Oh fooey. I did like Angels & Demons, although it took me making myself sticking with it until over halfway through the book and several "huh?" moments before I was sucked in. I've been trying to trudge through another Charles Dickens classic... David Copperfield... and I don't think I'm going to last much longer... I keep putting it down for weeks at a time and coming back. Maybe I should throw in the towel. umm i was reading your deal-breaker books, and numbers 2-5 YOU SHOULD FINISH ALL OF THEM!!!!!!!!!!!!!!!!!!!!!!!!!!!!!!!!!!!!!!!!!!!!!!! i'm serious! Every single one of those books! Angels & Demons is so much better than DaVinci Code and I read it 2nd. Tale of Two Cities is a spirit-compelling book with a clear portrait of the Gospel. 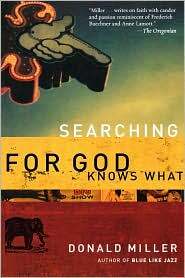 Searching for God Knows What... just had a conversation about that book today and a major concept found in it. and Wuthering Heights...are you kidding me? I wish I could perpetually be reading that book. Sorry to be such a ______ (i dont know what) but all four of those books I am VERY passionate about and you MUST FINISH! recently, i found myself in a book that was taking FOREVER to finish: Saturday by Ian McEwan (who wrote Atonement). I kept going and drudging through and it was awesome. The ending brought it all together. One book i will admit I have bought but not finished (or even come close) is the Beatrix Potter biography. Must... Read... A TALE OF TWO CITIES!!!!!!! Come on. It's definitely not beach material, so jump back on and read it. you MUST. I love 30 Rock... great episode! My biggest deal-breaker and maybe most embarrassing is "New Moon" from the Twilight series. I seem to do better with finishing books while I am at the lake. So maybe on your trip to Atlanta you can finish yours?! Ok, Guinn girls, I KNEW you were going to have a hissy over my unfinished books. I love books too! I know they are probably really good! But that's why it kills me that I couldn't get through them. I just...couldn't! Perhaps I need a Book Jubilee of sorts...after 7 years, I'll give a book a 2nd chance? Sounds perfect! So if i had to pick one from that list for your Jubilee that I freaked out over, it would be Tale of Two Cities. martha has said that is her favorite book, and she would also probably say that she likes to read about 1/10 of how much i do. Dude, I am WITH YOU on the finishing projects thing. I (used to) sit and watch the end of a show just to see what happened cause i wouldn't give up. then I got over it and time became a valuable thing. so I totally feel you on the giving up the books lately. life is too precious to spend your head buried in the pages of mediocrity. ;) at least you're ATTEMPTING to read. I gave up on that venture months ago. Ugh, Wuthering Heights. I had to read that for school. Thank you Cliff Notes! I could not get through it, and I'll read just about anything. I also couldn't do Great Expectations. It was not great.... at all. i definitely agree about "wuthering heights". my feelings towards that book could only be described with one word: hate. what was she talking about in that book? it is THE definition of boring. we had to read it in high school. i do have to disagree about "a tale of two cities". it is one of my all-time favorites. i can see, though, how it would not be everyone's cup of tea. Twilight series. I made it through the first one but just couldn't take it anymore after that. There was no depth there for me.